Our school colours are maroon, grey and white. 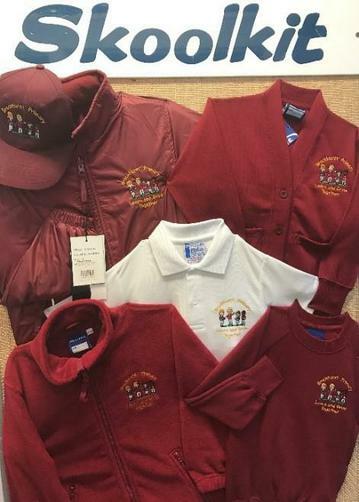 You can order the school sweatshirt, cardigans and polo shirts, each displaying the school logo, via the school office. Boys: Grey trousers, white shirts or polo shirt, and the school sweatshirt/cardigan. Girls: Grey skirts, pinafore dresses or trousers with white blouses and the school sweatshirt/cardigan. Boys: Grey shorts/trousers, white shirt or polo shirt, and the school sweatshirt/cardigan. Girls: Red & white check gingham dress or skirts, pinafore dresses etc as above with the school sweatshirt/cardigan. Black Shorts, white t-shirt or polo shirt & plimsolls (in a labelled draw-string bag, please) will be needed all year round. Please ensure that all items of clothing are labelled. Note: For safety reasons we ask that long hair is tied back for PE lessons and jewellery including earrings, cannot be worn. If earrings are worn to school on PE days your child must be able to remove them themselves and have somewhere safe to put them. Please ensure your child wears school shoes, (preferably black, which are sensible, safe and suitable for the weather conditions). Book bags are available from school at a cost of £5 per bag.